I took an early lunch in the basement of the Buddha Tooth Temple: three veggie dishes of beans, aubergines and mushrooms, plus soup and a bottle of water for $4.00 in an air conditioned, tranquil setting. Splendid. 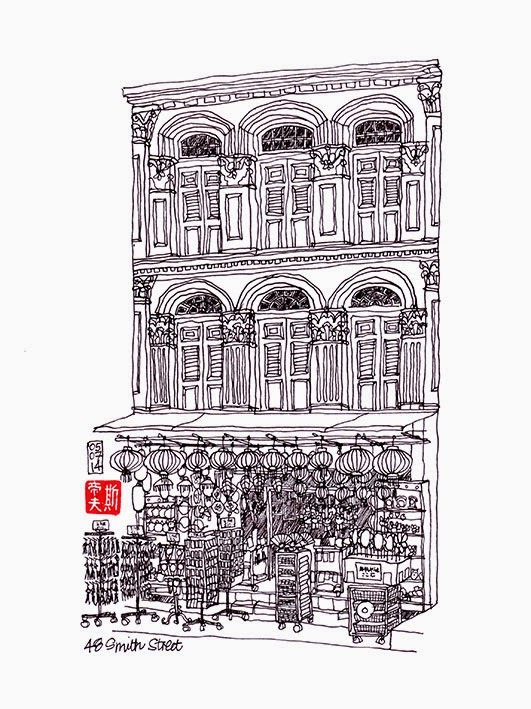 It was not so quiet on Smith Street where I settled down on a stool in a closed stall opposite a shophouse that I've had my eye on for a few weeks. Crowds of people congregated outside the adjacent restaurant while cars and lorries tried to squeeze through the barriers to gain access to other shops. Waves of food smells occasionally blew down the street momentarily distracting me from the sound of flute music which otherwise filled the air during the three hours of scribbling. Tomorrow I plan to draw a shop on Mosque Street I saw earlier in the day which specialises in papier-mâché luxury goods to offer the spirits.